On our way down to Wales a few days ago, we commented that the rivers were high, but not as bad as we thought they may be. We had a stack of rain over the last few days and heading back today, the landscape looked quite different in places. The rivers have risen and there were quite a few fields that were now rather liquid. Not a good start to the new year for many. The wind has picked up again as Storm Frank hits land. We paid a visit to Tenby this morning and there were times we struggled to stand. The waves were pounding the coastline and one poor chap was fighting the elements to bail out his dingy. I hope he did not have plans of going out in it today; the waves were a touch large. We are visiting Wales for a few days. The dogs have made a new friend and they are all having fun playing the game of 'make the humans fish the balls out from under the sofa/bookcase again'. The game has elements of "hook a duck" that is popular at fair grounds, and "Twister" when the dogs jump on you as you roll on the floor. I am not sure what game involves getting your ears licked, but they certainly like that one. The vegetables and fruit in the fridge seems to be getting safer each day. This cucumber seems to be supplied already appropriately wrapped. Its not that the sales have started, rather the kids had Christmas money they were itching to spend. 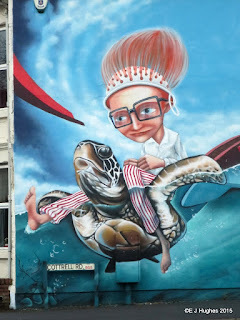 We went down to Bristol to the shops. We got there a bit too early (before any had opened), but at least there were lots of parking spaces. We had also discovered a few days ago that Katie's mattress was more springs than padding, so to console ourselves, we stopped at Ikea on the way back for a new mattress and had a dose of their meat balls for lunch. 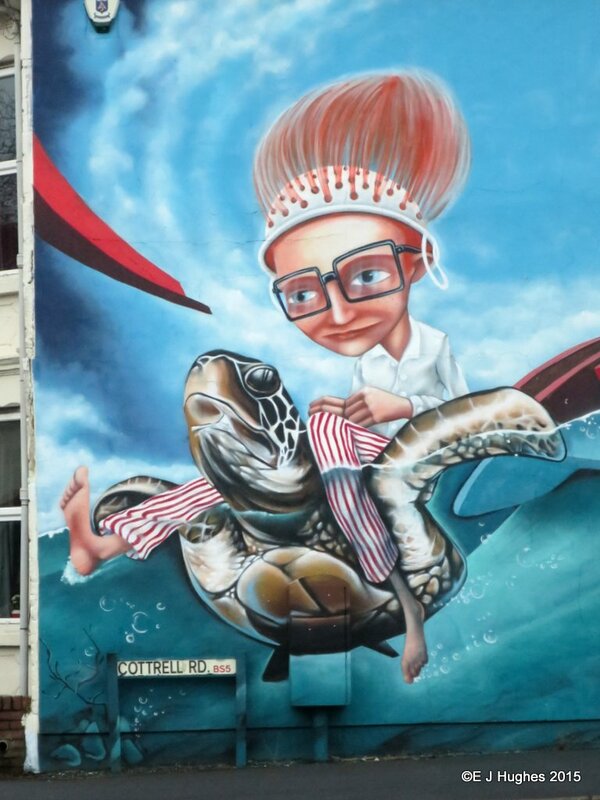 The traffic was slow on the way out of Bristol, giving me time to admire the local artworks sprayed on the sides of the houses. Boxing day is not just about the left over turkey, it is about overdosing on one or two of the presents (mostly of the game variety these days). 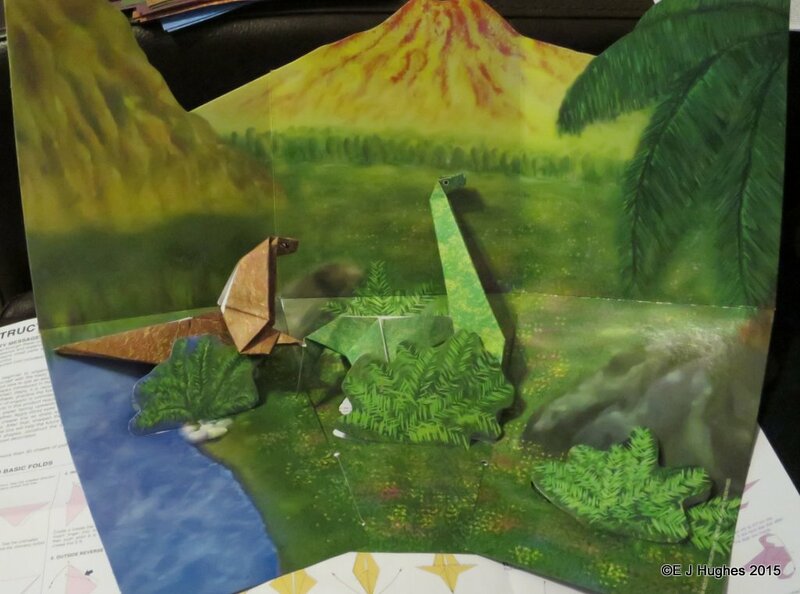 Alex had a break today from staring at a screen an took to an Origami set he had been given. He had good fun going back in time to a far more entertaining time before electronic entertainment. Today is the big day once again. 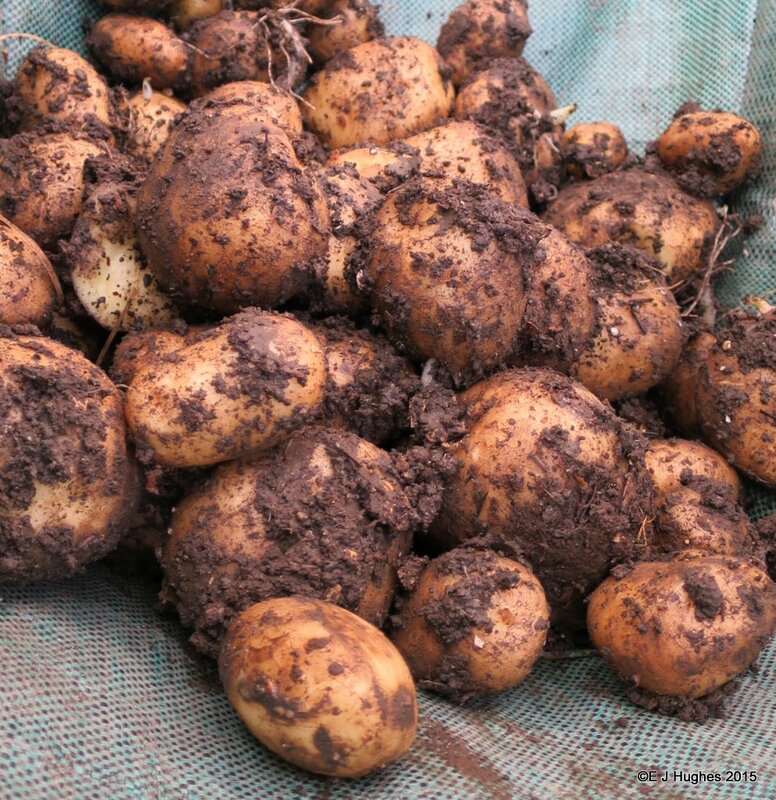 It seems to have been a good year for sprouts as they are a good size. I am sure that the gas build up will be spectacular too. Everyone seemed to enjoy their presents; even Muppet had fun ripping the legs of his new toy. The wind has stopped howling and the clouds have cleared tonight to reveal a rare full moon on Christmas Eve. I waited as long as I could, but did not manage to capture Santa and his Reindeers flying past in front of it. The Christmas tree was looking very short of mathematical decorations, so I fired up the 3D printer today. I found a rather nice pattern for a Koch snowflake: a fractal pattern. I was looking for some spices and noticed in a lonely corner, there was a small jar that had not been used in a while. The lack of use was not through choice, rather it got hidden and then forgotten. I shall dust of the fluff accumulation and put it back into circulation. Being the shortest day, I changed the photographic paper in the pinhole camera outside our bedroom. It has captured the last 6 months of 'sun' as a solargraph. The lines progress downwards from midsummers day to today. The lack of lines for October, November and December are a telling sign of the crap weather we have been having. The sun did rise this morning though and I managed to capture it before the cloud took over again. Jo managed to do a bit of digging in the garden and uncovered a whole stash of potatoes. The weather has not been too cold recently, but there has been the odd night we have lit the fire. It is the time of year when there are more shows put on. There are many cables we use to rig the lights and sound. Most seem to have 3 pins in. There could be a bit of a bang and smoke if the mains ones fitted any of the sound or light control gear! The recent 'named' storms have brought lots of wet, but nothing has fallen so fast that it has caused serious floods in our area yet. The ground is now fully saturated though, so it will not take much of a down pour to cause trouble. 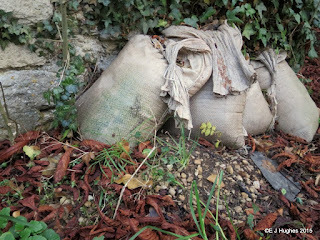 I spotted these sandbags today; I hope they will not be needed this Winter. I noticed today that behind this wall, there is a tangle of shrubs. 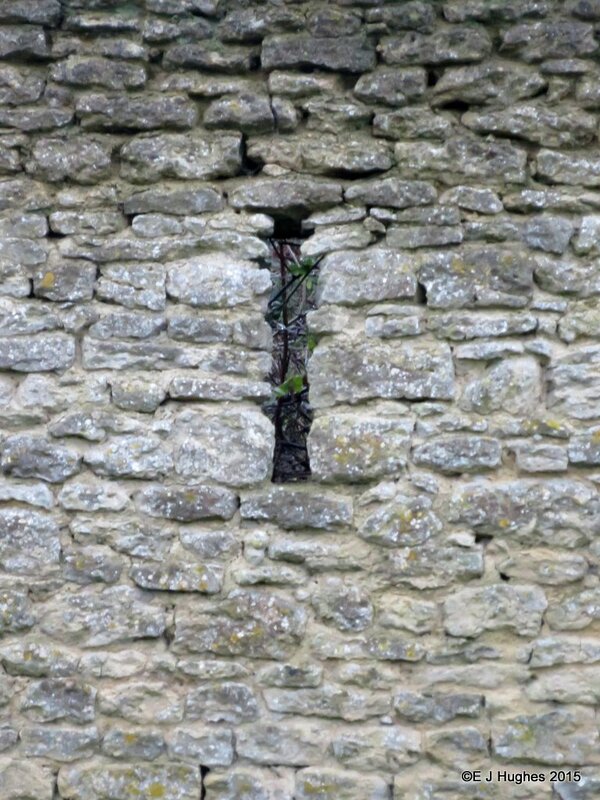 They are only just visible through the little slit in the wall. 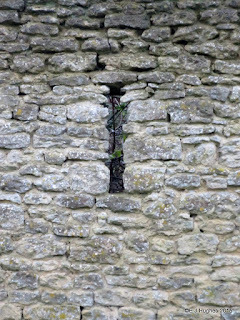 I am not sure how old the wall is, but it looks like it has been around a while. With the leaves almost all gone from the trees, there are all sorts of structures revealed. 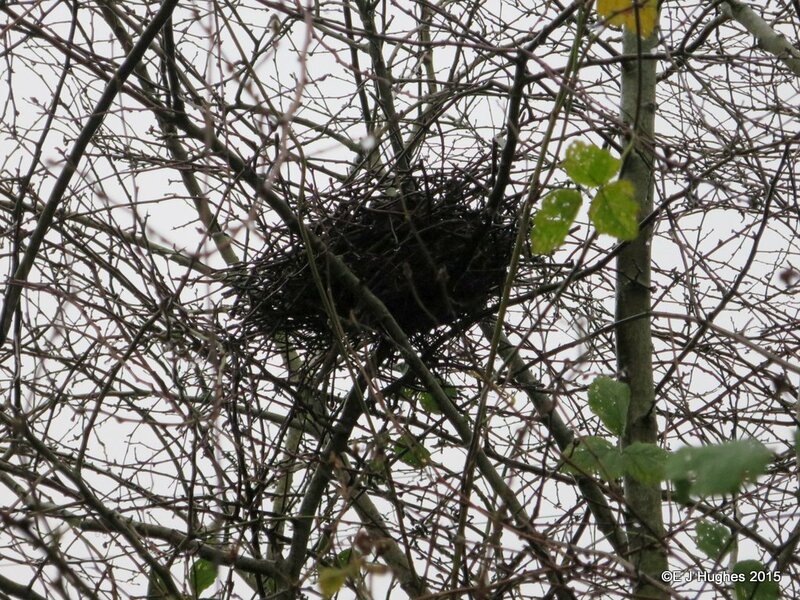 I spotted a nest today that although a scruffy tangle of sticks, is obviously sufficiently strong enough to withstand some really quite grim winds. I wonder if it will be repaired and used again next year by its creators. As part of the diet, we eat rather a lot of fruit these days. Some fruit you peel before eating, others you have to remove just a stalk. Many others though have something 'hidden' in the centre. The hidden bit is sometimes hard enough to break your teeth though if you chew it. The weather is still being grim. My wellies have not ever seen so much use as in the last few months. At least the mud is so liquid that it slides off reasonably well when I wipe my feet. The recent storms stripped the trees of there leaves a while ago. The apples held on a little longer. On the big cooking apple tree in the garden, this is the last apple hanging. I made some mincemeat yesterday and Jo made the first batch of pies today. The recipe is the same low sugar version as I developed the other year. I had a wander with my macro lens today. I found this bolt sitting quietly. The screw heads took my fancy though. 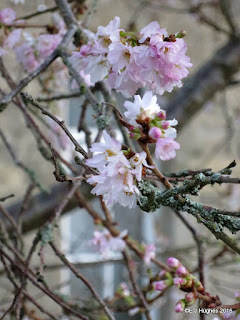 The warm wet weather has had strange effects on the trees around us. This tree is in full blossom already! I doubt it will come to much, although there are some bees still flying. I thought I may try capturing some of the subtle details of the world around us. The weathering and slight algae on this post caught my eye. We have quite a few other posts in the garden too, but they were not quite as interesting. We have been putting up the Christmas decorations over the last few days. The tree is looking good now, albeit the fake one rescued from the loft again. I had forgotten how much dust also gets packed away into the tree each year; the tree is heading on 20 years old now, so I did not shake it too hard! We have a guest staying today so it seemed like a good time to have a practice run for Christmas. We have plenty of crackers for the next few years, so it seemed sensible to do it all properly. All was great, apart from the pre-rolled stuffing balls were more akin to something that would not be out of place fired from a musket; just normal Paxo may be best for the big day we think. 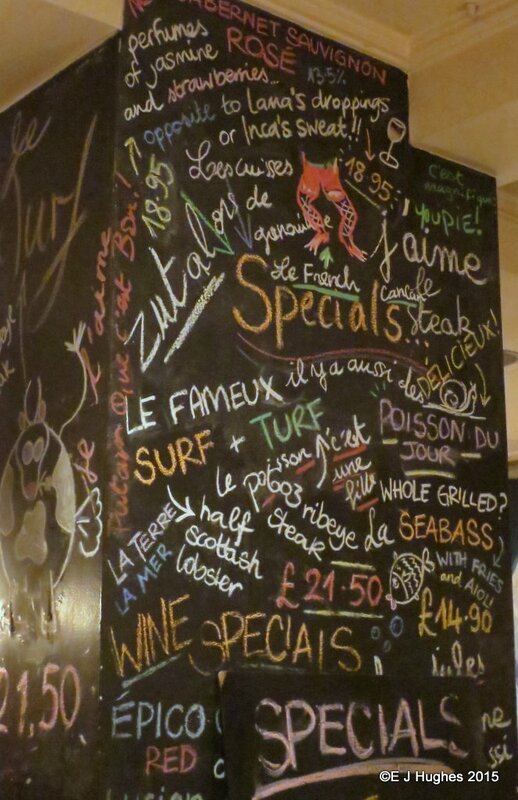 Although we have a decent sized chalk board painted on the wall in the kitchen, our desire for lists has outstripped it. In particular, I have taken to working out the menu for the week on a scrap of paper stuck to the cupboard. 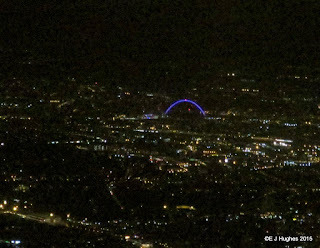 As we flew into Heathrow this evening, we got a good view of Wembley. 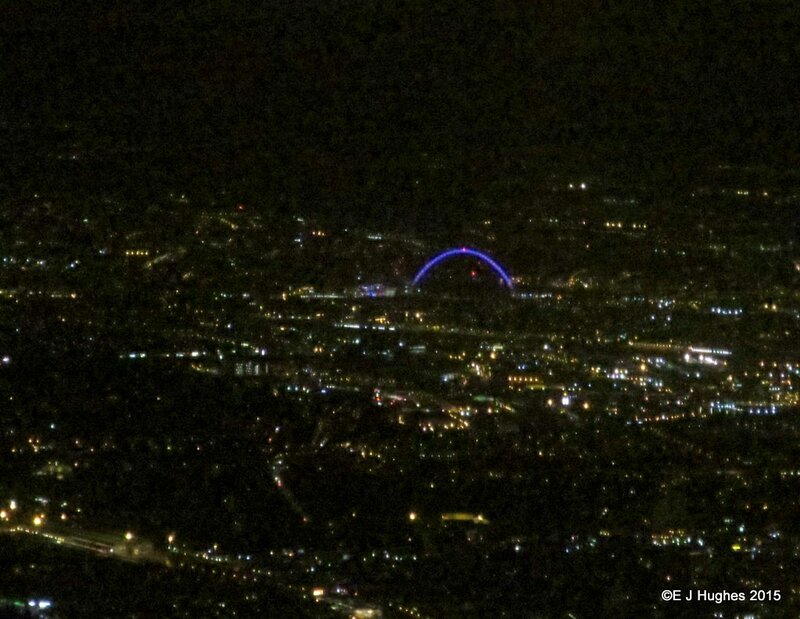 Unfortunately the timing of the flights meant that while I was in the air, Jo and the kids were at Wembley Arena dancing to music by The Prodigy. This evening was decidedly grim. 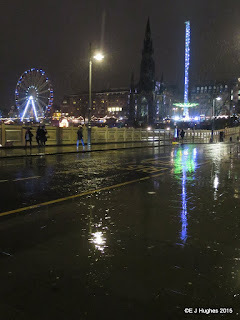 The sleet was falling fast as we walked out for our evening meal. I discovered that one of my shoes doesn't just have a hole in, rather it seems to have a 'pump'. Water gets sucked from the street as I walk, and pumped up through my sock to emerge in gushes out of the top of my shoe. I had to spend a few minutes when we arrived at the restaurant wringing my sock out, and had a cold foot all evening. Christmas lights are meant to be a bit tacky, but sometimes naffness gets taken beyond extreme. 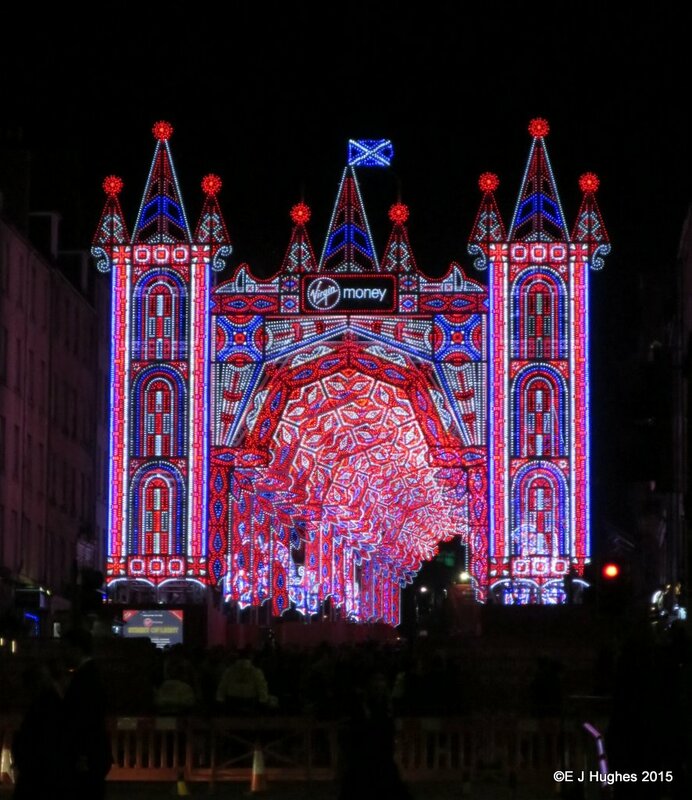 In Edingburgh this year they had a 'street of light'. Not only did they may you walk down dark side streets to avoid it, but it lit up the sky with a very dubious splendour. I do not know how much was spent on the lights, but I am sure the homeless I passed while walking up and down the narrow side streets would have preferred a small string of lights, but in a well funded shelter. Some may call me a Grinch; Merry Christmas! There are few eating places that have such a special charm that it is worth making a special trip to when we are in the area. 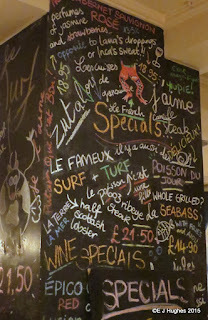 There is one small 'French Style' restaurant in Edinburgh that we always make a special effort to visit. Not only is the food good for a reasonable price, but the place certainly classes as having an 'eclectic' atmosphere; the menu hints at the random charm that pervades the place. 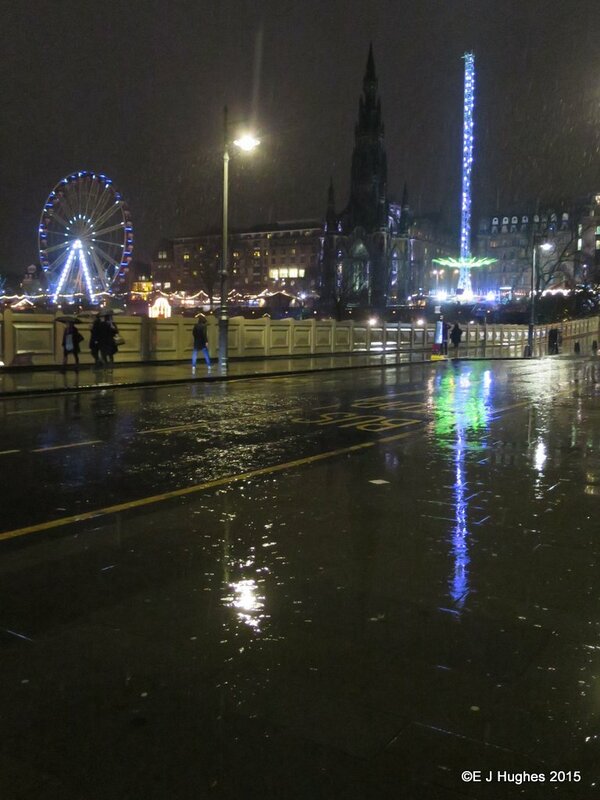 Here in Edinburgh, the Christmas fair is in 'full spin'. The high-flying, vomit flinging, chair-o-plane ride is back again. The ride has been here a while already as Christmas starts earlier every year, but I wonder how many kilos of coins, phones, glasses and vomit will be liberated from the unwitting riders by the time Christmas arrives. I am going to give the ride a wide berth if I walk past while it is running. This brush may be small, but it makes its presence known with its shocking pink colour. It does not matter if it comes loose and makes its way to the bottom of the dish washer; it is easy to spot. I find it interesting that manufacturers of speciality teas all seem to think that their product is so delicate and fragile that it may need a safety rope. It is not as if the rope is intended to stop the bag falling into boiling water. Personally, I have no problems with guiding a spoon under a tea bag to gather it when it is spent. We popped down to Cardiff this evening to see another band. Bring Me The Horizon were playing and provided really quite a spectacle. 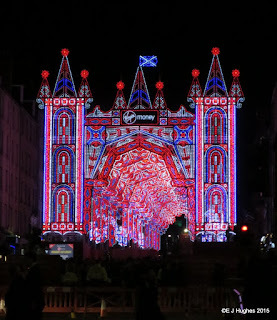 The light show was fantastic and the songs fab. Most of the apples have either been picked, or have fallen from the trees in the recent strong winds. This particular apple got wedged in the tree branches; it is detached but probably does not count as a windfall. Clips and catches are really useful for keeping lids on jars. This jar is used many times a day, but the clip is still functioning well. It is amazing how useful a bit of metal and bent wire can be. I broke out the macro lens again today. I thought I would capture a piece of modern photography that often is hidden. The contact pins on the lenses are important for the modern systems, but it is nice to think the macro lens is fully manual and has none of these (well done Nikon for not changing the main lens mount fitting for the last 50 years!). There was a tiny hint of frost yesterday morning, but today it was the proper job. I had to scrape the car and the field was white. Now is the time to pick nettles though as the frost seems to make the stings far less effective. I passed this barbed-wire fence today and noticed that it was covered with leaves which have been captured by the spikes. There were not many trees nearby so why there were so many leaves trapped I am not sure. The wind has been strong though so they could have come for miles. The biggest surprise though was the dusting of snow we had! I was looking though my lens boxes and came across my 2x tele-converter. I thought I would experiment with trying a few photographs of the moon again. It was out long before dark, so at least I could see what I was doing with the camera. I tried hand-holding the camera, but the shake was a real problem. The tripod is much more stable, until the dog leans against a leg and has a scratch! It is always interesting to try something new. Today Jo found a Dragon Fruit in the supermarket and thought it would be fun to try. It was quite a shock when I cut it open to see quite how pink it is! It didn't taste of much though, so it appears to be mostly display rather than flavour. It has been really windy today and the TV aerial pole has now snapped completely. 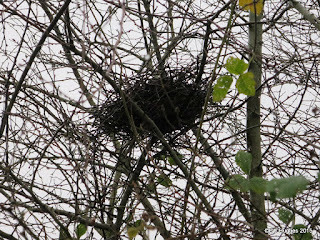 The aerial has been swinging in the wind and banging noisily on the chimney. If the cable breaks, sods law is that the metalwork will slide down the roof and onto the cars below! This evening I went to shut the chickens down and there was a new egg! All 5 girls stopped laying some time ago when they decided to moult, but fingers crossed, one will keep going now and keep us in eggs over the Winter. Although a 'classic' pose for an egg, I could not resist a bit of still life.